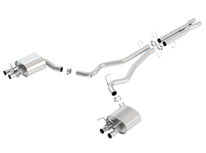 This system utilizes the factory exhaust tip/bezels and features valves for the Selectable Driving Mode. 2015-2019 Mustang Shelby GT350 5.2L Automatic/Manual Trans. Rear Wheel Drive 2 Door w/Selectable Driving Mode.